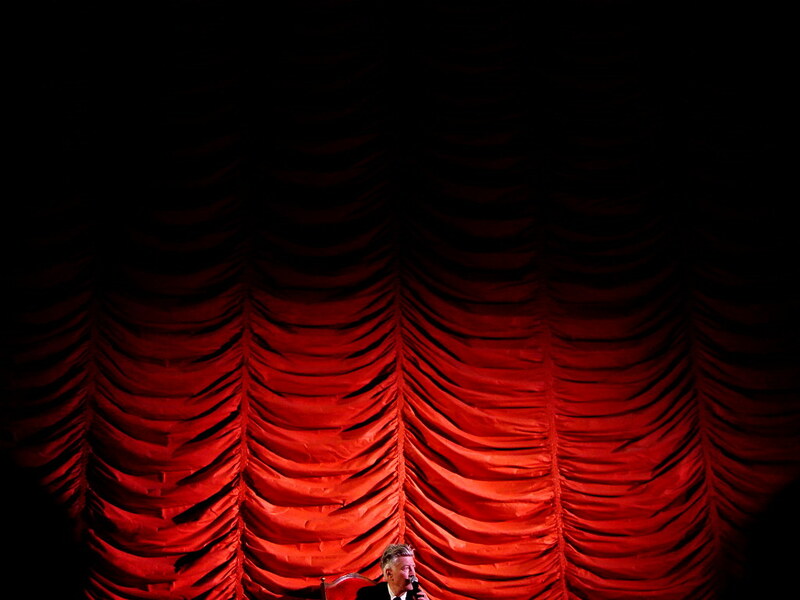 Sitting in a big, red chair in front of the Music Box Theatre’s old red curtains, David Lynch raised one of his hands in a fluttering motion. Those fingers kept twitching as he spoke, answering audience questions after a screening of his new film, “Inland Empire.” The movie is pure Lynch – a three-hour hallucination that perfectly illustrates the dictionary definition of phantasmagoria: “a rapidly changing series of things seen or imagined, as the figures or events of a dream.” After a somewhat coherent first hour, resembling Lynch’s previous film “Mulholland Dream,” the new film disintegrates into one long nightmare. It’s brilliant in many ways, though it’ll tax the patience of some viewers. Just think of it as a restless night of dreams in which you forget where you are and even who you are. And don’t try too hard to figure out what it all means. Before the film, Lynch introduced musician Daniel Knox, who played an improvisation on the theater’s organ. And then Lynch unfolded a sheet of paper and recited a verse from the Aitareya Upanishad: “We are like the spider. We weave our life and then move along in it. We are like the dreamer who dreams and then lives in the dream. 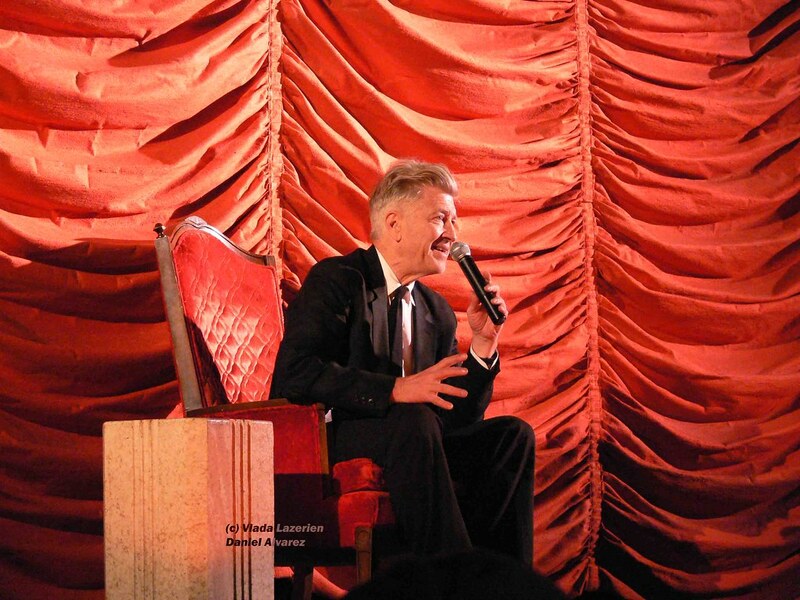 This is true for the entire universe.” After the film, Lynch took a seat and answered questions from his fans. The following is a nearly complete transcript, omitting some of the audience compliments and niceties. Q: I was wondering why you didn’t work with Angela Badalamenti on this…? A: I love Angelo Badalamenti like a brother, and I’ve worked with him on many things. It just didn’t happen that I worked with him on this one. He lives in New Jersey, and I live in Los Angeles. Like I always say, if he lived next door to me, it would have been a different thing. Q: The sound design was fantastic as always… I was hoping you could share your thoughts on sound design. A: In cinema, there’s many elements rolling along together in time. And so you try to get every element to feel correct based on the idea. And sound … has to marry with the picture, so … the more abstract sound effects and the music all have to work in marriage with the picture. … It’s an experiment based on the feel of the idea. Q: What inspires you to create what you film? A: Ideas. Ideas are the thing that drives the boat. And you’re going along, like I always say, and you don’t have an idea, and you don’t have an idea, and then, “Bingo!” There’s an idea. I get a lot of ideas. But sometimes we get an idea that we fall in love with, even if it’s just a fragment of the whole thing. And I fall in love with them because I love the idea, and I love what cinema can do with that idea. And that’s it. And if you get one idea like that and you focus on that, other ideas come swimming along and join it, and the thing emerges. Q: In your past films, there have been some amazing, colorful cameo appearances, from Henry Rollins in “Lost Highway” to Billy Ray Cyrus in “Mulholland Drive.” I was wondering if you could comment on how these cameos come to, and what is the inspiration behind them? A: The rule is you try to get the right person for the part. And following that, I see still photos, I work with a woman named Johanna Ray whom I love as the casting director – I work from still photos and then pick out the people that look like they might work, and then meet the people and talk to them. Billy Ray Cyrus, he came in for another, completely different role, and he was videotaped him by Johanna. I’m looking at this videotape and he’s completely wrong for the role he came in for, but I see that he can play Gene the pool man. Q: Could you share the experience of Richard Pryor in “Lost Highway”? A: Richard Pryor, we all love Richard Pryor. I don’t know where that came about. I’m so happy that his name came up or somehow I got the idea that he could play the owner of the garage. He was in a wheelchair at that time, but so sharp – unbelievable. You’d just turn him loose and he would riff forever. And so funny. Really great working with Richard Pryor. Q: I’ve read that you’re optimistic about people, yet many of the characters in your films fail… ? A: I’m optimistic, for sure. But you know, ideas come for stories and scenes… So a lot of times, there are characters that are failing pretty miserably and others that are doing OK, in a world of contrast, which is a story. Q: I was wondering if you could talk about the work of Laura Dern. Q: Laura Dern delivered an excellent performance in this film, and I’m quite surprised she didn’t receive an Academy Award nomination … Do you think it’s a possibility that the Academy voters didn’t see this film? A: Do I think it’s a possibility that they didn’t see it? A: Yes. It’s a big possibility. … We were a hair late supplying screeners, but we did supply screeners. I don’t know. You know, sometimes the Academy surprises and gives awards to who we think really deserves it. Other times, they surprise us in the other direction. It’s just, like they say, the way it goes. Q: You both deserve to be on the red carpet on Feb. 25. Q: You were on the Alex Jones show a little while again and you had some questions about the official story of 9/11, and I was wondering if you could comment on that. A: No. You know, we’re here to talk about “Inland Empire.” But there are many mysteries in life, and that 9/11 is one of them. A: The cow is in California. Q: Couldn’t make the trip? A: It’s hard to travel with a cow. Q: Were you influenced at all by the films of Krzysztof Kieslowski? I noticed there were a lot of scenes set in Poland. A: Fear is part of negativity. There’s fear – there’s all kinds of words: Anxiety. Depression. Sorrow. Corruption. Violence. Crime. There’s any number of words that make up negativity. With the ability, which we humans have, to dive within, and experience this ocean of pure consciousness, the source of thought, the base of mind, also the base of matter, one giant ocean of pure, vibrant bliss consciousness – if we experience that, that experience enlightens it and we grow in this bliss consciousness. We grow in creativity and intelligence and dynamic peace, energy and power. It’s all right there within us. A side effect of growing in consciousness is negativity begins to recede. They say negativity is just like darkness. And then you say, “Well, let’s look at darkness.” And you see that darkness is nothing. It’s just the absence of something. So when the sun comes up, that light, automatically, without the sun trying, removes darkness. Just like that. This light of unity, this light of pure consciousness, rising up, and negativity begins to recede. It’s a real thing. It’s a real thing. And negativity starts to lift. And so much freedom, so much more flow of creativity comes, from learning a technique that – there are many forms of meditation, but if you are interested in lifting negativity in yourself or lifting negativity in the world, look into this beautiful thing within every human being. Unbounded. Infinite. Eternal. Immortal. Vibrant. Bliss consciousness. It’s there for everybody. Q: Do you like George Romero? A: I love George Romero. Q: My question is a little bit random. What’s your favorite animal and why? A: Well, you all saw “Inland Empire,” so maybe rabbits. Rabbits are pretty happy. Q: I don’t have an arts background. I’m a scientist, but I’ve always appreciated your work. A: That’s very beautiful. Arts people enjoy science, and sometimes scientists enjoy art. Q: I read somewhere that a Biblical verse inspired certain parts of the film. A: No, no, no. That’s “Eraserhead.” In “Eraserhead,” I was maybe two-thirds of the way through, and I hadn’t finished it. The thing was sort of there, but I didn’t know what it meant. I didn’t know what it meant for me. All the parts seemed correct, but overall, I didn’t know what it meant. I was just yearning to know what these ideas were adding up to. And that’s when I got out this Bible and just starting going through it. And lo and behold, there was a sentence, that I said, “That’s it. That’s exactly what this is.” And I closed the thing, and off I went. Q: With “Mulholland Drive,” you said you had a moment when you didn’t see the ending at first. Q: Was there a moment like that in this film? A: Yes. The analogy is if you are in one room and picture a man in another room, and he’s got a completed puzzle, but he’s popping one piece of puzzle into your room. And that’s the way it is with all things in the beginning – just getting pieces of the thing. And the more pieces you get, maybe sometime along the way, you start seeing something. And then it goes more rapidly from there. It just goes like that on all of them. Q: Could you talk a little bit about your decision to use digital instead of film on this movie? Was it economic or were there aesthetic reasons, and once you started shooting with digital, did it change the way you went about making the film? A: Digital. I started making some digital experiments for my Web site with this Sony PD150 camera, which I thought at first was a toy. I kind of liked working with it. It’s easy to work with and you see what you’re getting, and you can go to work and edit it right away. Very beautiful. And I started getting ideas for a scene, after that meeting with Laura. And I started writing the scenes and then shooting them. Getting the idea, writing it and shooting it with the Sony PD150. Not with the idea knowing that it was going toward a feature. So it was a strange way of working. Once more and more of the story started evolving, I saw that it was going to be a feature, but stuck with the Sony PD150, because I didn’t want to change horses in the middle of the stream. We did tests upresing that image and going to film. Although it’s not the quality of film, it has to me its own look, a beautiful look. And every little difference of the medium, it starts talking to you. Ideas seem to come to merit to a certain field that digital was giving. The thing about it, is it’s a small camera. Automatic focus. Forty-minute takes. You see what you get. You’re in a scene with 35mm with a big Panavision camera and a big dolly, and you’re in the scene and nine minutes if the magic is just starting to happen, you have to stop and reload. If you want to turn around, it’s like giant, heavy weight. Huge amount of loss of time. Relighting. So heavy, the lights for film. This is a dream. You go into a scene, you can go deeper and deeper and deeper. Me and the actress go deeper and deeper and deeper and deeper, no interruptions. And maybe a magical thing can happen that wouldn’t have happened otherwise. Digital is the thing. And it’s getting better every day. Film is, as I say, sinking into the La Brea Tar Pits. Q: The title of the film, “Inland Empire,” also refers to a geographic region in northern Idaho and Washington. I understand you spent some time there when you were a child. Did that affect the way you made the film, and is that just a coincidence with the title? A: I’ll tell you the story. I was walking to Laura, and this was after we’d gone down the road a little ways. And she said her husband – Ben Harper is her husband – grew up in the Inland Empire, which is an area they call east of L.A. And she went on to talk about where it was and all this, but my mind stopped on this word “Inland Empire.” Even though I’d heard it before, now I’m hearing it afresh. And I stop her, and I say, “That’s the title of this film: ‘Inland Empire.’” And it felt correct. Two weeks later, my brother is cleaning the basement of my parents’ log cabin in Montana and finds an old scrapbook, opens it and sees that it’s my scrapbook from when I was five years old, living in Spokane, Washington. He wraps the scrapbook up and sends it to me. I open it up. And the first picture is an aerial view of Spokane, Washington, and underneath it says, “Inland Empire.” So I had a very good feeling that it was the right title of this film.